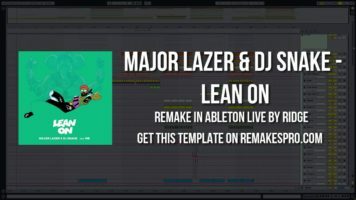 Download | Major Lazer & DJ Snake - Lean On (Ableton Live Remake) + Project File! Major Lazer & DJ Snake – Lean On (Ableton Live Remake) + Project File! This video “Major Lazer & DJ Snake – Lean On (Ableton Live Remake) + Project File!” has video_views plays on Youtube. And a total of 26 Likes and 4 Dislikes at the moment.